You are required to develop new Technologies in order to access new types of Buildings and Troops. Construct the Research Center to begin researching new Technologies. The more you upgrade the Research Center, the faster you complete research on new Technologies. Researching each Technology costs Uranium, Titanium and Credits. The more advanced Technology, the more expensive it is. The cost of upgrading a given Technology also becomes progressively more expensive with each higher level. Construct the Research Center and you'll gain access to the Tech Tree. It lets you view new Technologies to Research and plan your Sector's development. While in your Sector, click "Technologies" on the right-hand panel to open Tech Tree. You can drag the Tech Tree from right to left, zoom in and out using either your "scale" control at the bottom right-hand corner of the screen, or use your mouse's scroll wheel. how many Experience Points you get for researching it. Hover your mouse over the "Research/Upgrade" button to find out how much it costs to research this Technology. After a certain point you will find that you need to acquire a set number of Modules to unlock research on a specific new Technology. Choose "Send Module" to send them a Module. 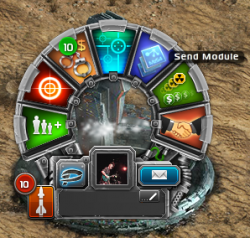 You can also go to Map, find your Friend's Sector, and choose "Send Module" on the drop-down menu. If you research Technology, exchange Modules or send them to your Friend as a gift they disappear from your Sector. It's a physical object - not a schematic. You will not retain a copy. Technologies that unlock new Units have 20 upgrade levels. Pages in category "TD Technologies"
This page was last modified on 10 September 2014, at 11:47. This page has been accessed 17,849 times.